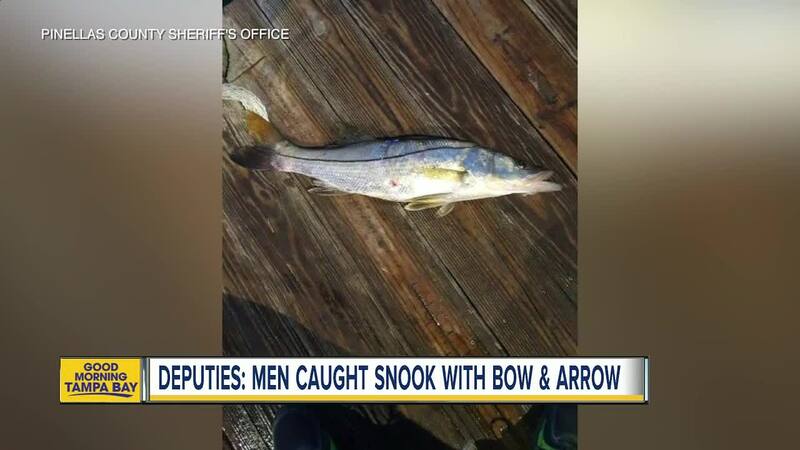 PINELLAS COUNTY, Fla. — Pinellas County deputies have arrested two men after they trespassed to illegally harvest snook with a compound bow earlier this month, deputies say. According to deputies, at about 4:30 a.m. on July 9, 2018, 35-year-old Derrick Ennis and 27-year-old Carols Gonzalez, walked around a 6-foot chain link fence armed with two compound bows and trespassed at a closed business known as Don's Dock located at 215 Boardwalk Place in Madeira Beach. Deputies say Ennis and Gonzalez ignored the posted "no trespassing" signs and used the compound bows to shoot and kill snook that were in the water next to the dock. Surveillance video at the business captured images of the men illegally harvesting and killing multiple snook at the business. Deputies say Ennis and Gonzalez were then seen leaving the area in an older model Ford Ranger truck. Later that same day, the business owners viewed the surveillance video and notified deputies of the incident. Deputies obtained the surveillance video and placed photographs of the men on social media in an attempt to identify the suspects. Through various investigative techniques and with the help of social media, deputies were able to confirm Ennis and Gonzalez were the men in the video. Deputies presented the case to the Pinellas/Pasco State Attorney's Office and a warrant was issued for Ennis on the criminal charge of Armed Trespassing. Deputies interviewed both men and they admitted to the allegations. On Wednesday, Ennis was arrested by Florida Fish and Wildlife Conservation Commission officers at his residence in Dade City. Ennis was booked into the Pasco County Jail and he will later be transported to Pinellas County for his charges. On Thursday, deputies arrested Gonzalez at his home in St. Petersburg. Gonzales was transported to the Pinellas County Jail. He was charged with one count of Armed Trespassing. Deputies say additional fishery violations are pending on both men for illegally harvesting snook out of season, over the bag limit, and illegal method for harvesting snook.